This month's contest is a two parter = a better chance to win. 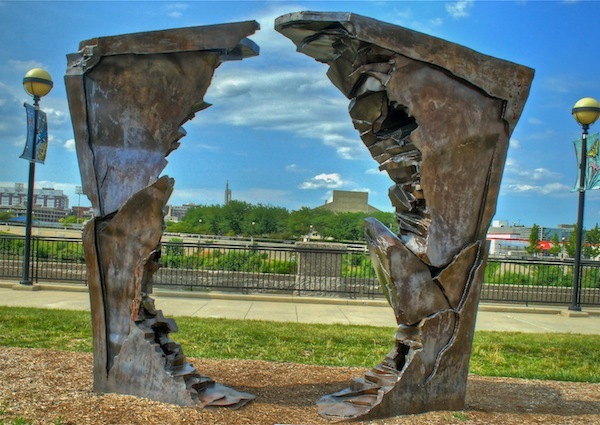 First, name the location of this sculpture for a $25.00 gift card to Scotty's Brewhouse. Second part, tell me the name of the sculpture and I'll make it another $25.00. We could have two winners this month. The first one who tells me where the sculpture is located wins, as well as the first person who tells me the name. If you are lucky enough (or just know your Indy sculptures) to be the first to tell me both - you win double and can take your friends to Scotty's with you. No waiting until the end of the month this time; after all, March Madness is just around the corner. Photo and blog are copyright of Paula Henry and HomeToIndy.com. All rights reserved. One day and we have a winner! I guess that WAS easier than last month :) Thanks Brian - I'll be sending your gift certificate for Scotty's. Enjoy!